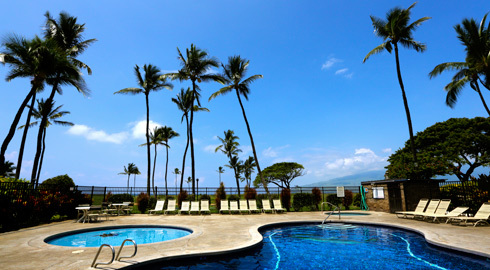 Kauhale Makai means “Village by the Sea” in Hawaiian, which aptly describes this family-friendly retreat right on the ocean in north Kihei. Two buildings with 168 units stretch towards the sea on tropical manicured grounds, complete with shuffleboard, volleyball courts, pool, children’s wading pool, hot tub, putting green, gas bbq areas and sauna. There is coin-operated laundry on property for your convenience. Located on South Kihei Road, Kauhale Makai is a ideal home base for exploring Maui. Some of the world’s most beautiful beaches, superb shopping, renowned restaurants, and world-class golf are just minutes away.